E-commerce Automotive Aftermarket size was worth over USD 8 billion in 2017 and its demand is predicted to cross 1 billion unit by 2025. Increasing aging vehicles results in need for the auto parts due to excessive wear and tear impact. This will pave an opportunistic way for e-commerce automotive aftermarket participants, thereby stimulating demand for various products such as interior accessories, audio tapes, coatings, electronics, modifications, car care products, and exterior decorations. E-commerce automotive aftermarket industry share is estimated to witness significant gains owing to rising disposable income and customization offering aesthetic appeal to the individual’s vehicle. Easy availability coupled with cost saving factor of automobile components are the prominent factors escalating the e-commerce automotive aftermarket sales. Increasing technological advancements for query solving via online portals has resulted in industry growth. Do-it-yourself is done for less complicated parts and timely cleaning & replacement of small parts that require less tools. OEMs are focusing on research activities of hybrid and electric vehicles resulting in increased complexity of the vehicle parts. Substantial growth in sales of these vehicles has encouraged the industry participants to extend their product portfolio and cater to rising demand. Thus, rising zero emission vehicle adoption rate is accelerating the e-commerce automotive aftermarket induystry size from 2018 to 2025. Lack of regulatory framework may result in high frequency of counterfeiting in the e-commerce automotive aftermarket. In various countries online infrastructure is less suitable for buying the products or delivering at the vehicle failure point. The existing business model, of online shops do not provide an effective solution for satisfying customer needs of prompt delivery. Poor online infrastructure may negatively affect the e-commerce automotive aftermarket industry. E-commerce automotive aftermarket from third party retailers will account for more than USD 29 billion by 2025. Distinct services are offered by the online channel distributors resulting in frequent buying behaviour of the customers. Sunday and Same day deliveries is boosting the segment revenue. Direct to customer segment will exhibit over 20% CAGR between 2018 and 2025. This can be credited to customer preference towards brand recognition of the product and availing appropriate service facilities. Expansion of online platforms will drive the individual customers size. For instance, Bosch has launched its own online portal to strengthen its distribution channel and customer base. 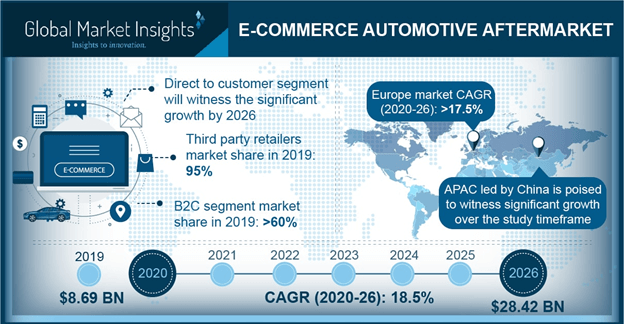 B2C segment in the e-commerce automotive aftermarket market will pose a CAGR of over 20% from 2018 and 2025. This can be credited to customers preferring online shopping for automobile parts due to cost effectiveness as compared to conventional brick-and-mortar stores. Technologically advanced products, provision of lesser prices, and fast query solving are few techniques by which the segment will observe robust growth rate. B to Big B sector in the e-commerce automotive aftermarket is predicted to cross USD 8 billion over the projected time span. This channel is observed as important channel as it enables availability of substantial number of products at low cost along with prompt delivery services. The segment sales have observed high competition between online automobile component suppliers, traditional retailers and distributors. E-Commerce automotive aftermarket in Asia Pacific is expected to account for over 34% volume share over the forecast time span. Increasing automobile manufacturing across the region, particularly in developing countries including China, India, and Indonesia is primarily driving the industry growth over the forecast timeframe. Moreover, presence of giant industry players such as AliExpress is fueling the regional growth. Industry participants are engaged in enhancing their services such as AliExpress introduced e-commerce live video service that is AliExpress LIVE. North America is predicted to pose over 18% CAGR in the e-commerce automotive aftermarket industry. Presence of major giant companies such as Amazon is likely to drive the regional industry growth. Well established online infrastructure in the region supports in high revenue generation over the forecast period. 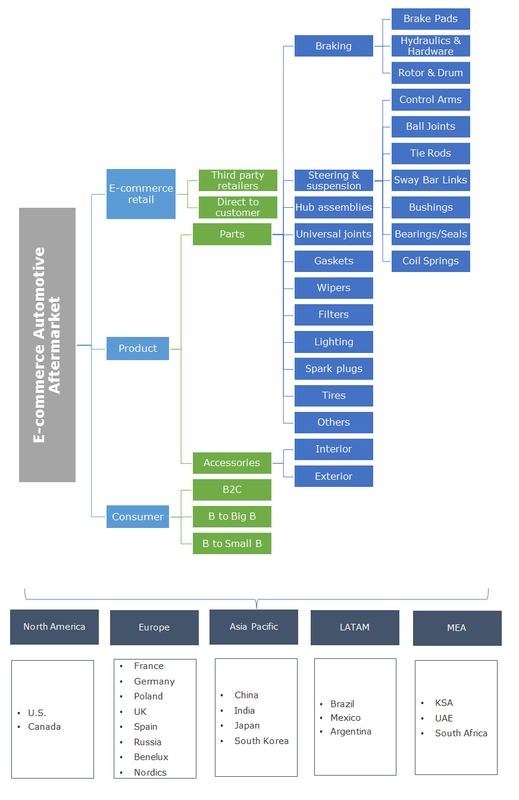 E-commerce automotive aftermarket participants includes Amazon, Flipkart, E-bay, AliExpress, Auto Zone, Pep Boys, Advance Auto Parts, CARiD, O’Reilly Auto Parts, Napa Auto Parts, Bosch, and Denso Corporation. Industry players are engaged in increasing their customer base by offering enhanced visibility on their websites. Multi-channel shopping is also witnessed as a trend across various nations. The industry players focus on price reduction to gain customer base, inducing immense potential to the industry size till 2025. Several e-commerce automotive aftermarket players focus on differentiating their services to enhance their customer traction. For instance, in November 2017, Amazon introduced its Prime services to the Netherlands and Belgium. Major auto product manufacturers have adopted online channels for enhancing their revenue generation. Same day delivery, handling returns, and cross border are among the major challenges faced by the industry players. Other challenges faced include variable payment method along with diverse shopping habits of the customers.